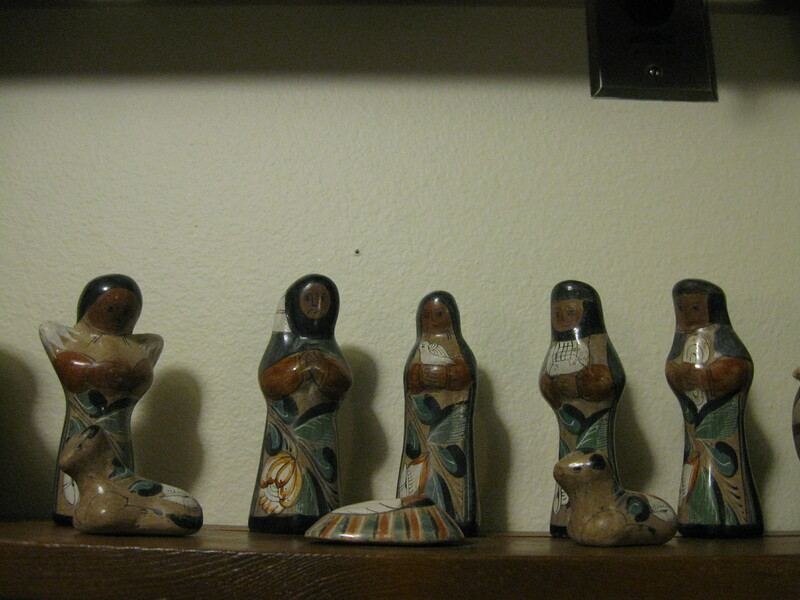 I have quite a few objects in my folk art collection which cause me to ask questions. — A good thing; because it keeps my mind active. — For example, I have carvings which I know, just from my collecting experience, come from the African continent. But I don’t know their exact country of origin. Or maybe I know that; but I don’t know the carver’s tribal affiliation. And then, there are pieces in my collection which are total mysteries to me. I have a few of those. (I had more before I downsized my collection in the early 2000’s. I wish I had saved those.) Anyway, I’d like to share a few “mysteries” with you here. St. Martin is a very small island located in the northeast Caribbean. The island’s main industry is tourism. And, here is a vintage souvenir, which somehow wound up in my town, Seattle, WA. What I know about this wonderful doll is only what I can glean from holding it in my hand and looking at it. If you search for another on the internet, you probably won’t find one. If you do, send me the photo! I’ve found no similar photos or info in my searches. It’s made of a painted gourd, wood, cloth and some type of natural fiber. I’d love to know what culture the person who made this belonged to. There are many nationalities represented in St. Martin. But this doll looks like many of the African dolls I’ve had in my collection. During the time of slavery, St. Martin was involved. I’d say this was made by a person from the Creole people — someone who can trace their lineage back to the indigenous, African and French cultures. I’d love to nail down the tradition represented here. — I would say this dates to the 1950’s or 60’s. The one thing I can say about this little horse is this: it’s probably not Swedish. I collect Swedish carved horses and chickens, and they aren’t decorated like this. But once again, I’ve seen no other photos of this item. The poor little horse has pretty much lost its little ears, which were made of leather or a plastic material. It still has its straw tail. I love it for its primitive beauty; but I know nothing about it origin. It was made of a clay or plaster material which was dried, painted and decorated. I’m curious to know if it was part of an assortment of circus animals. If so, I’d love to see the rest! I keep this not only to add color and whimsy to my environment; I keep it to give me something to wonder about. Not a clue…. It seems rather middle-Eastern or Asian to me. But my internet search has been fruitless. It’s a beautifully-carved horse and rider. More, I cannot say. I display it with my African art, because it — well, it doesn’t clash. I’m not sure how to date this piece. It’s made of a hardwood, which has stood up to the years very well (excepting a crack which runs vertically down the middle, which may have been caused by a fall). A piece like this could have been made close to a hundred years ago, or thirty years ago. Again, I’m clueless about this piece. I also have this figure sharing space with my African art. I like its eyes, its large brows, its curves. Judging by its condition, I’d say it has some age on it. It could date back to the 50’s. If I was to take a wild guess, I’d say an Indonesian carver created this. It doesn’t really look African to me; Indonesian carvers are highly skilled. To my eye, this piece is simple, but perfect. *Update: I am gonna say Borneo. Since I wrote this, I was looking through a twenty year old book I have, entitled “Living With Folk Art”, and I saw a carving from Borneo that looked a little similar. I Googled “Borneo Wood Carving” and saw a few more that looked similar. And, I can say that if it is from Borneo, then it’s by the Dyak people, it has some age on it, and it’s worth a bit of money. Members of many of our planet’s cultures have decorated utilitarian objects. For example, our American Northwest Coast native population made just about everything they used into art, whether it was a bowl, a fish hook, or an every-day utensil such as a spoon. I don’t usually collect folk art spoons or forks which were probably made for sale to tourists as art, and not really intended to be used. I find them a little “tacky”. But I was intrigued by this one. It features a beautifully-carved human form. The carving does offer one clue which could help ID it: the very top features a motif which I would call Indonesian. But I could be way off. I tend to go with Indonesian when I can’t pin down a carving’s origin (I do this in a sort of tongue-in-cheek manner. It’s like Grateful Dead dancing: when in doubt, twirl! Or in this case, when in doubt, say Indonesian). I truly know nothing about this beautiful coiled basket’s origins. I know little about baskets in general, and I have few in my folk art collection. I’ve concentrated more on collecting tribal pottery, as opposed to tribal basketry. But I have had the pleasure of viewing many Native American baskets at the Maryhill Museum near Goldendale, WA, a town where I played hundreds of country music nightclub dates back in the 1970’s. It is so worth the drive, to visit Maryhill. I could do a whole post on that museum. It is housed in the poured concrete building Sam Hill intended to be his home. Yes, he is the Sam Hill, as in “Where in the Sam Hill?” — And, just a few miles from the museum, you’ll find a replica of Stonehenge. Yes! The basket: I only bought this basket because it was pretty, and it was deeply discounted at an antique dealer’s going-out-of-business sale. I’m not sure how old it is, or what country it comes from. Baskets like this could be Asian, Native American, or South American. Do you have any info to share? (Sad note about the antique store: the owner was forced to close due to “progress”. The building the store was in was condemned for total destruction, so that a new structure could be put in its place. That was two years ago, and absolutely nothing has been done on the site. The antique store, tavern and dry cleaners that occupied the building could have continued to serve the public for another two years, at least.) *Update: since writing this story, I’ve looked at many more photos on the web. This could be a Hopi basket. I’m still far from certain…. Let’s finish with this complex piece. 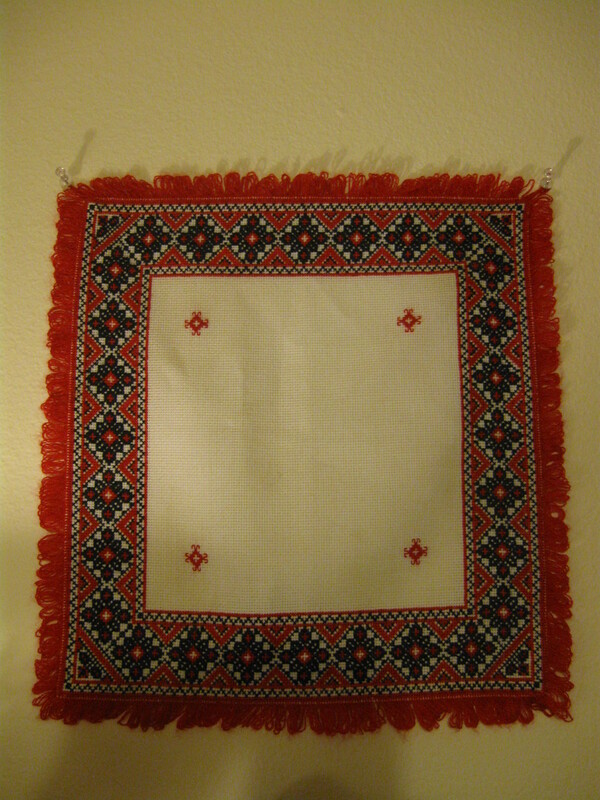 In the center, which is surrounded by a border made of several pieces of cloth which have been stitched together, is a beautiful example of Southeast Asian embroidery. I’m going to share two photos here, in hopes that someone will be able to tell me what country/tribe this comes from. It could be from the Hmong people, who inhabit the countries of Vietnam, Laos, Thailand and China. Or, it could be from the Khmer tribe of Cambodia. I’d love to know. 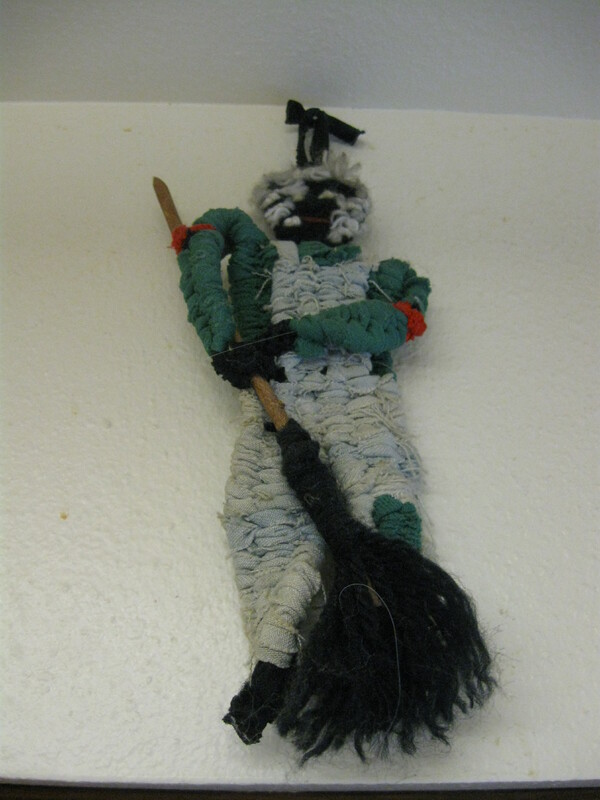 I bought the wallhanging, which measures about 3.5 feet in length, at a Seattle estate sale twenty years ago. It was already somewhat faded from exposure to sunlight. I’d say it’s at least thirty years old. I looked on the www to try to find examples of the motifs, below, with no success. The purpose of this story is to not only to share some mystery pieces with you, but to ask for your help in identifying them. Please comment, if you can offer any assistance. And, thanks, in advance. I mentioned in my introduction that I have African carvings which, while I’m sure they are from Africa, I can’t say where they came from, or what tribe the carver was a member of. Here is one of those. I wouldn’t say it’s really old…. If you have any info, please share. *Update: I finally found a similar image. It’s undoubtedly a carving done by a member of Ghana’s Ashante tribe. I can’t say how old it is. The carving I found on the internet was described as “vintage”. But aren’t they all? Finally, just for comparison, here is a photo of a Swedish carved horse. Just one village in the entire world is the source of these carvings: Bergkarlås, which is located in central Sweden. They’ve been carving beautiful renderings of domestic livestock for hundreds of years. I used to have some amazing, vintage carved chickens from Bergkarlås, but I sold them to a young woman named Kim, who was completely taken by them, at one of my garage sales.– Well, I was completely taken too. By her. She got a good deal. Here is Maryhill Museum, nestled in its beautiful Eastern Washington home, near the Columbia River. Go! Its decorative arts collection in amazing. 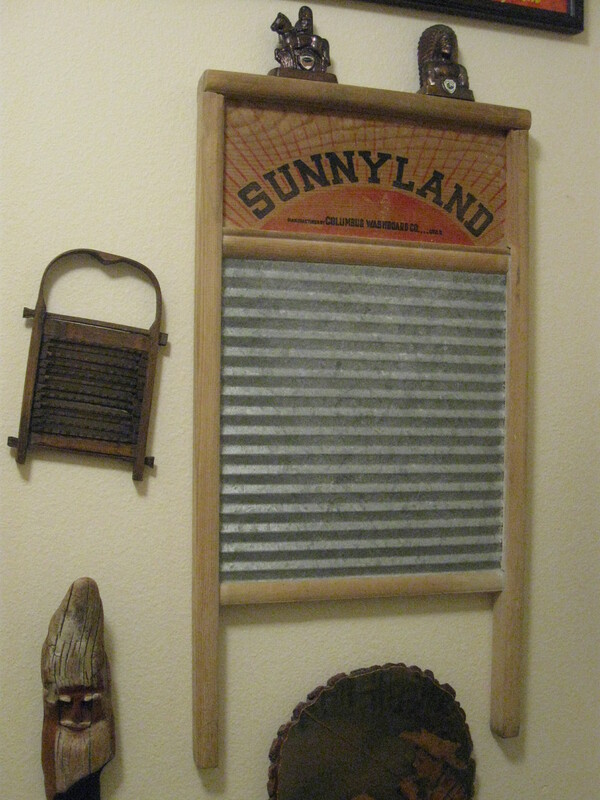 This fabulous vintage item, made by the Columbus Washboard Company of Columbus, GA, is not exactly folk art, as it was made in a small factory. But it was hand-assembled. 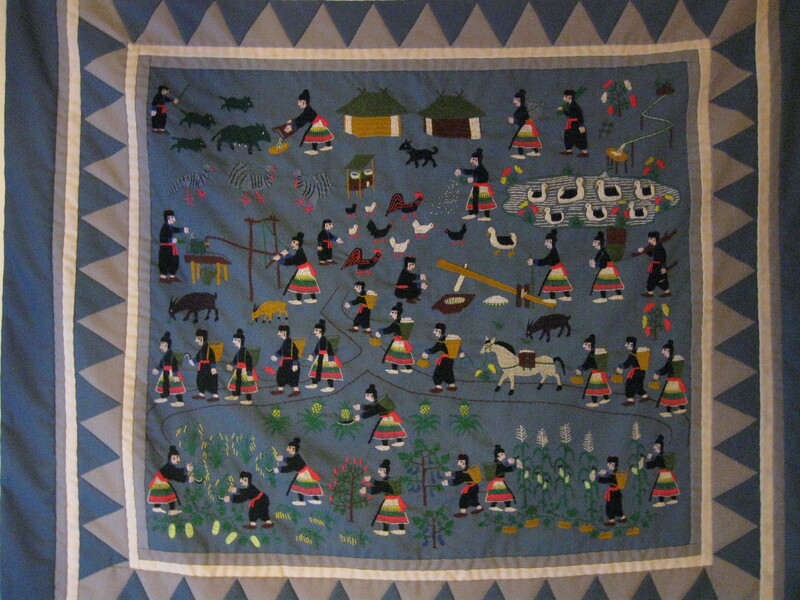 And it’s surrounded by other examples of folk art and hand-work from my collection. Collecting and decorating with folk art is my passion. I’d like to give you a little transfusion of that passion. Because I think folk art can be displayed in practically any interior setting. I live in a really plain, poorly made, 1980’s apartment building. The art works well to disguise the drabness of my place. On the other hand, folk art would fit in nicely in a vintage home. I’ve also seen it displayed in tres’ modern settings, where it looked great. It added a human touch to the otherwise minimalist glass and metal interior. I’m going to share examples from my collection, from several cultures — cultures within and without America. Let’s start off with some Native American creations. And please keep this in mind: I’m a collector, not an expert. One of my rarest finds. 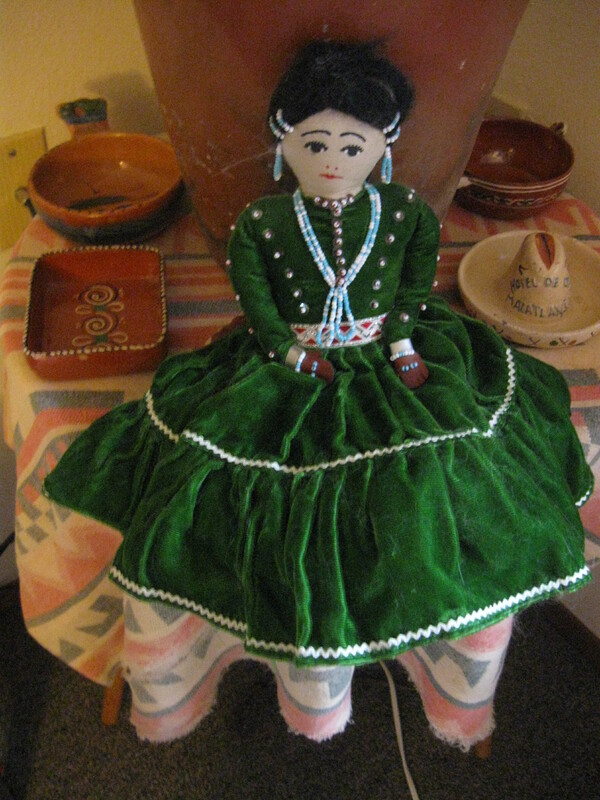 My Navajo doll sits on a 50’s vintage beacon blanket, surrounded by old Mexican pottery from Tlaquepaque. 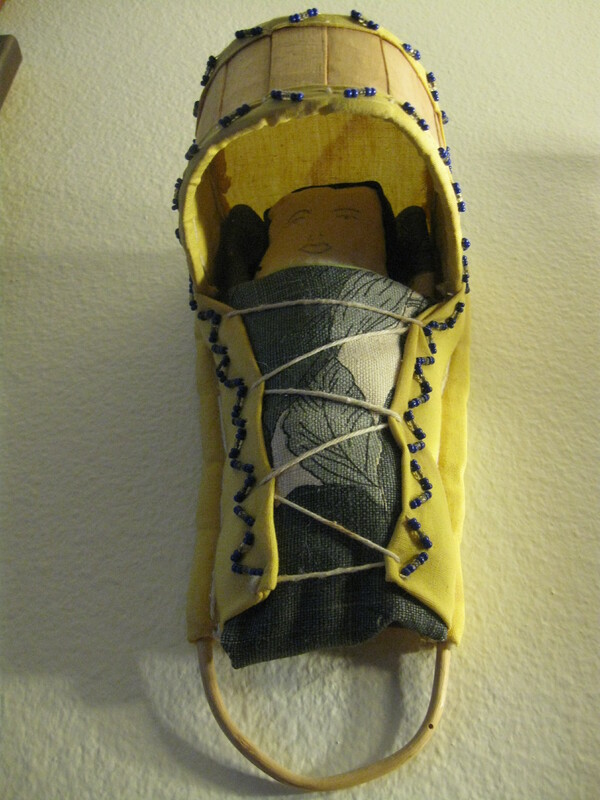 You can find Navajo dolls at flea markets and antique malls. The ones you find could date from the 1950’s, to the present. There’s a long tradition of making these beautiful dolls. I’ve had many over the years. I had to downsize in the early 2000’s, and regretfully, I sold some wonderful ones. But I know they went to good homes; that gives me some solace. This is a particularly attractive one. She has a skirt and two underskirts. (Is that what they’re called? I’m a guy….) There’s a generous amount of bead-work. — I remember my Mom using her Singer sewing machine to attach trim, or bric-a-brac, to fabric. This doll’s dress has that trim, so I know it’s not extremely old. I’d say it’s from the 70’s. She compulsively makes these; I compulsively buy them. 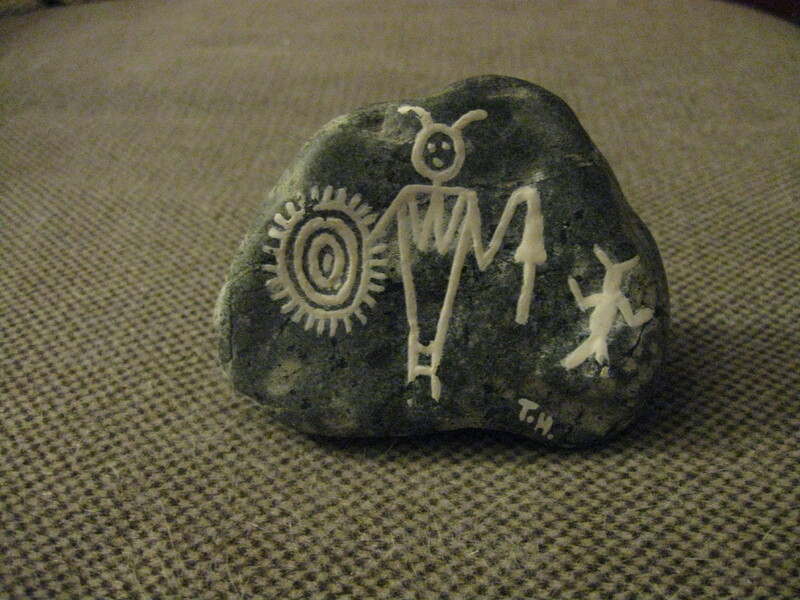 Here is a painted rock, by Teresa Hopper of Puyallup, WA. Teresa goes to the river and carefully picks out the rocks she paints. This particular one is her interpretation of a Native American petroglyph. Teresa doesn’t claim Native heritage; but she likes to pay her respect, and she just has to do this. She’s painted thousands of rocks, each one with great care, in many styles. I have a whole collection of these. I was so honored when she walked around my apartment, circa 2000, taking photos of my art, so that she could replicate it on her wonderful rocks. This one cost me about $4. Her prices are way too reasonable. This doll, and its mate which follows, were not made to play with. They were made for hanging on the wall as art. The dolls are made, at least partially, from those little cloth loops which are often used on a small loom which makes potholders. I found this pair for a very low price, in a plastic bag, at an antique mall. I couldn’t wait to take them home, liberate them from the bag, and give them a spot in my African-themed kitchen. 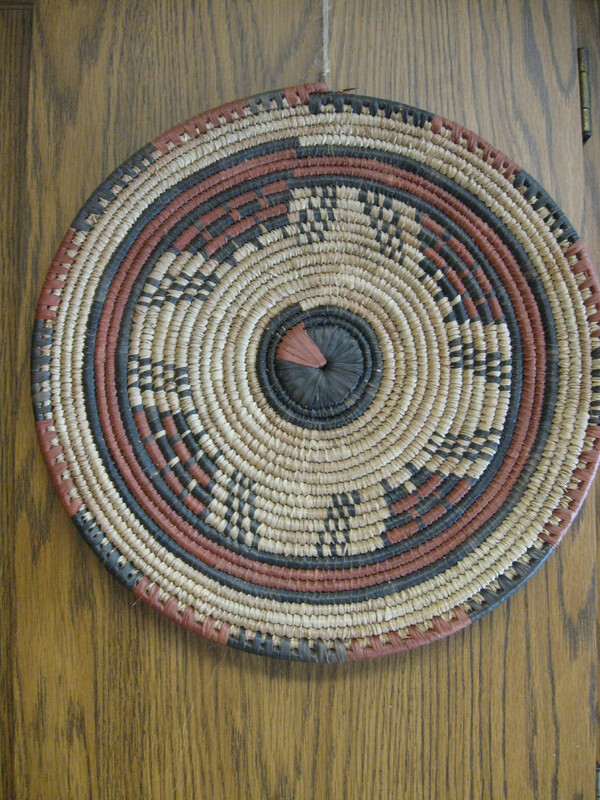 This is a very well-made Ethiopian basket. 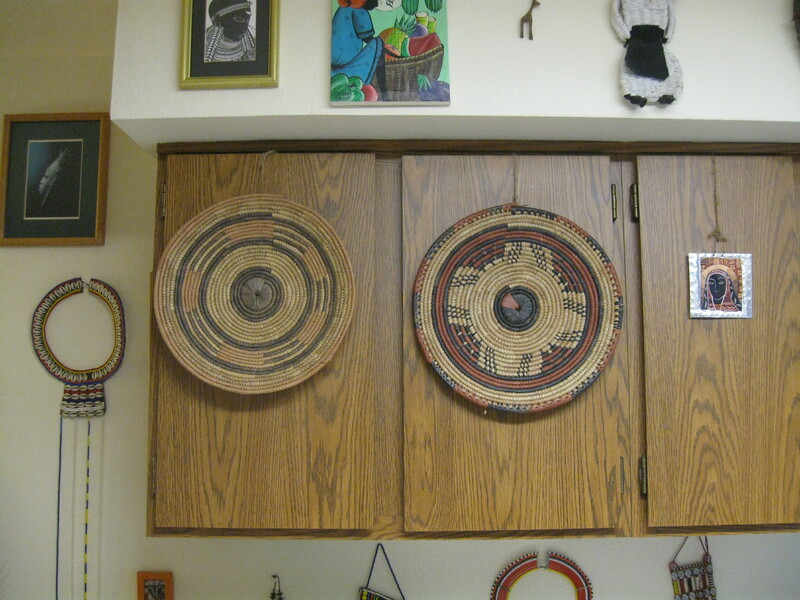 I have extremely ugly kitchen cabinets; so I have one of these beautifully woven baskets hanging on each cabinet door. Suddenly the ugly brown “Contact paper” facade becomes a much more attractive background for this great art. Look for preowned ones at antique stores and flea markets, or new at African art stores, which most medium-sized and larger cities will have. I love all Ethiopian art, including their beautiful Coptic Christian crosses, of which I have two. I got lucky when I found this. I collect manger scenes, aka creches. 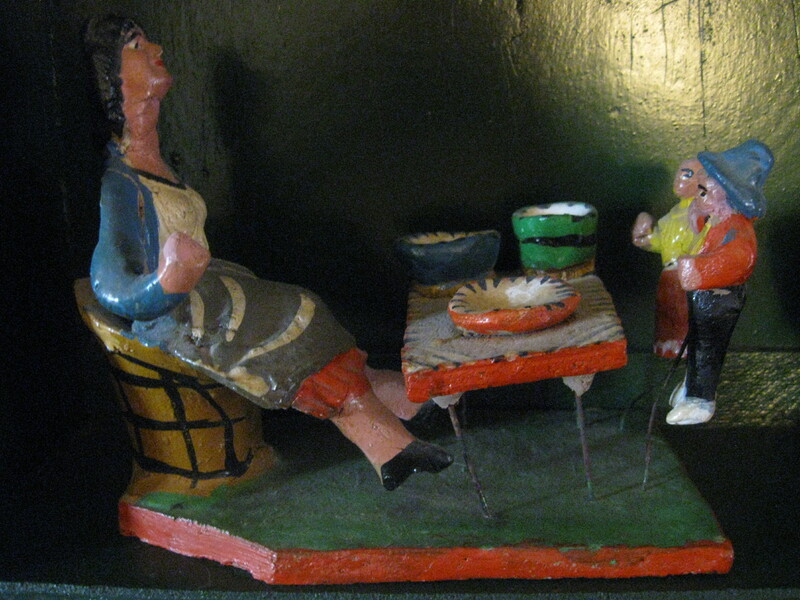 This one was made of fired clay, in the Mexican state of Jalisco, where skilled artisans live. I just love it; I leave it up all year. It’s too pretty to display only one month out of the year. You can find these, new, at import stores like Ten Thousand Villages. This set is about twenty years old. Jalisco work is pretty easy to identify. Look for glossy glazes and smooth modeling. — It won’t have the rustic look of the plaque which I featured above. Wow. And speaking of rustic Mexican art: this wildly painted grouping is just that. But I adore it. I’ve had to glue it back together. I think I still have an arm somewhere which needs to be reattached to the mother. Things like this are made of clay, dried, and painted. Not fired. Very breakable. But if you want a bit of pure whimsy, pure color in an area of your abode, put this there. Here’s one last Mexican piece, about which I know little. I found zero examples on the www. — Partly because I don’t know what to call it. 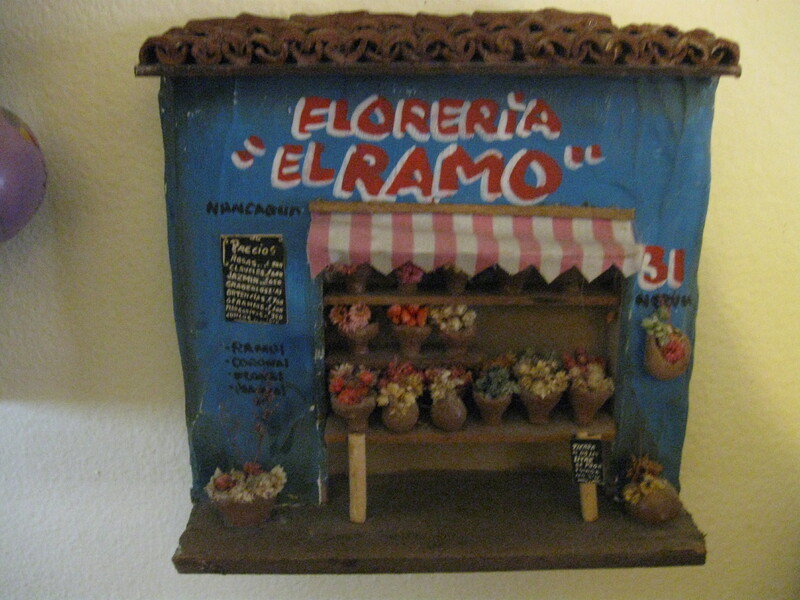 But it’s crafted from slabs of clay, modeled and painted to depict a flower shop. I did manage to see a few on sale for about 40 bucks apiece in a folk art gallery in Seattle, circa 2000: the late, lamented La Tienda Folk Art Gallery. I have little information to share with you. I’d say it’s at least fifteen years old, because that’s the last time I ever saw one. It’s large enough, and colorful enough, to look really good on your wall. When I move house, I always carefully stake out a special spot for this. Let’s visit Brazil. This is my only Brazilian piece. 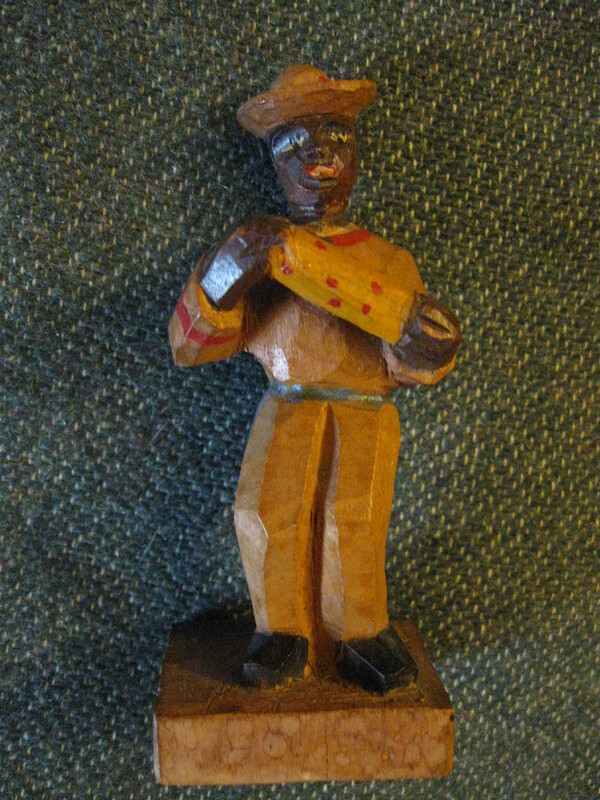 It’s a wonderful carved figure of a percussionist. The label on the bottom tells me that it comes from a street named Santos Rua in Frei Gaspar, a small city located in the northeast of the state of Minas Gerais. The carving has an African look to it. Many enslaved Africans’ descendants help to make up Brazil’s population. The African influence in the arts and music was and is strong, just as it was and is in American towns like New Orleans, LA. A side note: Brazilian music is so wide-ranging. It has so much to offer. Brazil is a large country, represented by many cultures. 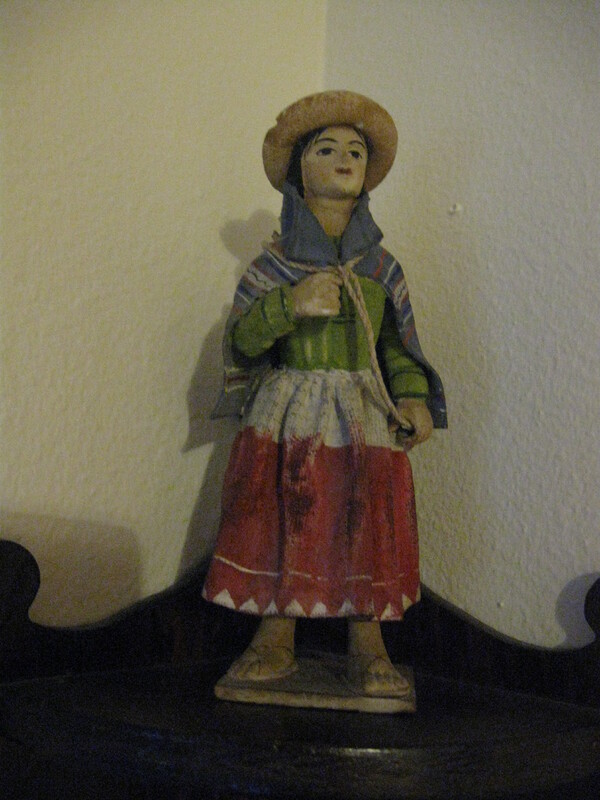 I found this beautiful, vintage Peruvian clay figure in the 1980’s. When my late wife and I visited the Museum Of International Folk Art in Sante Fe, New Mexico, I was so happy to see many of these, displayed in dioramas. They came from the collection of one of the most noted collectors anywhere: the late Alexander Gerard. His collection, which he donated to the museum, forms the backbone of the MOIFA’s great offering of folk art. 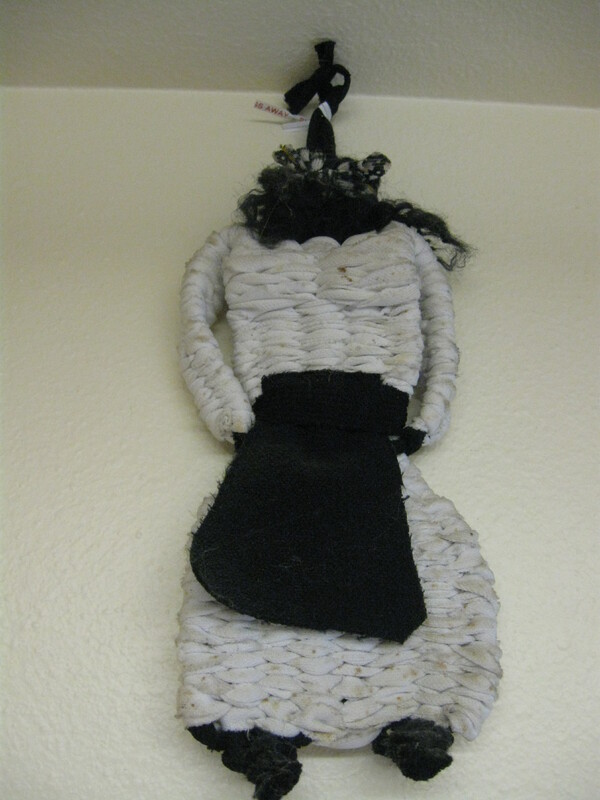 This figure is dressed in a traditional cloth costume; the cloth has been stiffened in some manner. Perhaps it was painted over with paste or starch. It’s a rare, signed piece. I couldn’t make out the artist’s name, which is there, but faded; but it also says, “Peru 1944″ on the bottom. That would make this little lady 72 years old. She’s not exceptionally large (6.5” tall); but she’s so beautiful that she easily holds her own when it comes to improving my decor. 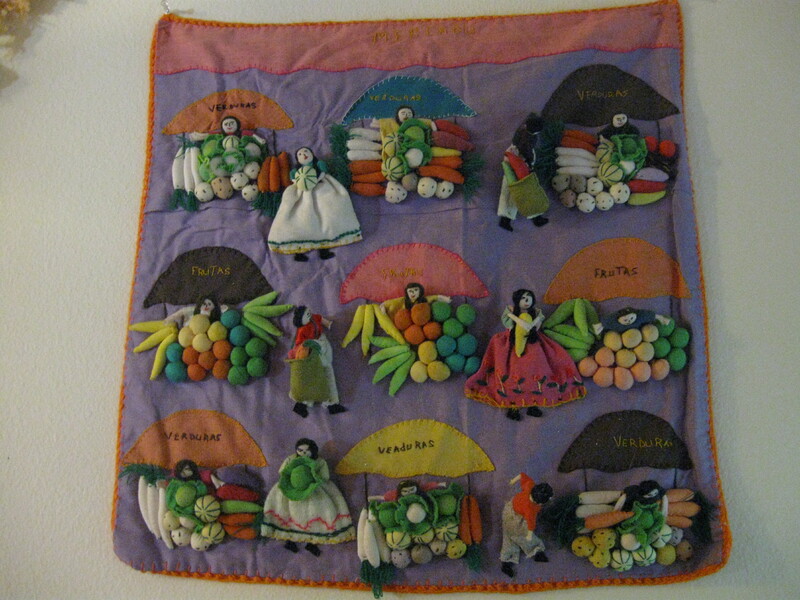 This amazing, 3-D applique wall hanging from Peru has some age on it. You can see how it’s been faded by exposure to the sun. I bought it used, at an antique mall, nearly 30 years ago. As is usually the case with hand-made art from around the world, older pieces just seem to be better — more detailed. (You can definitely find new ones today; but try to find an older one. You’ll see the difference in detail.) The woman who made this from little scraps of colorful cloth should be very proud of her work. — I take and share many photographs. I share the most colorful, pretty ones. I hope in some small way, my photos can beautify the world in the manner that this wall hanging does. I prefer to call them secret-keepers. This is a whistle — more accurately, a flute! By blowing on the hole, you’ll hear several beautiful notes played simultaneously. 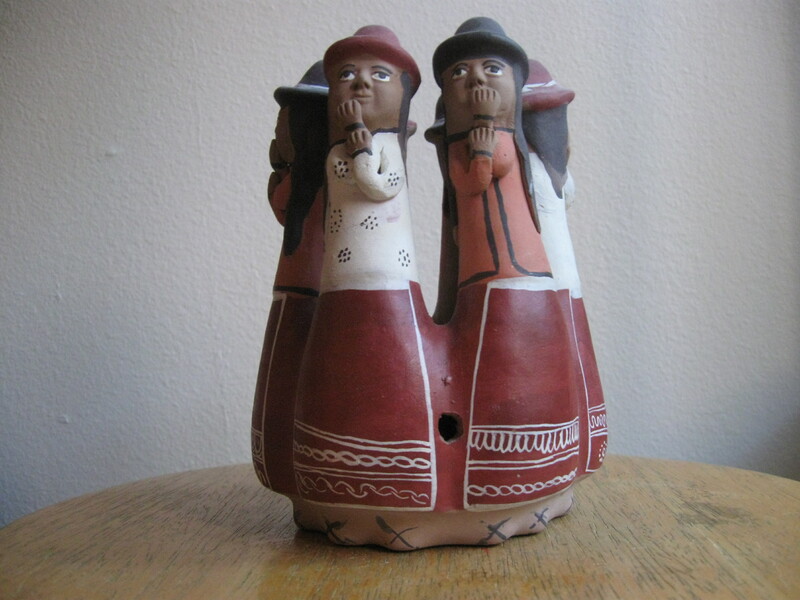 This group of Peruvians is known as the “gossipers”, because they’re whispering secrets behind their hands. I don’t really like that name…. This piece is twenty years old. It’s definitely an example of a newish piece, which is not made with the same skill an older one would be made with. It looks like the bulk of the piece was formed in a mold. Then, small pieces such as the hands, were added on. I know this, because I had to reglue a hand back onto the piece. (Elmer’s glue is excellent for this.) It appears to have been painted rather than glazed. I like it; but if I could spend the same money, approximately twenty bucks, on a vintage piece, I would. I’ve had people describe these figures to me as Indian temple toys. I was told they were used to familiarize children with the various Hindu gods. However, I’ve had a difficult time confirming that in my www searches. 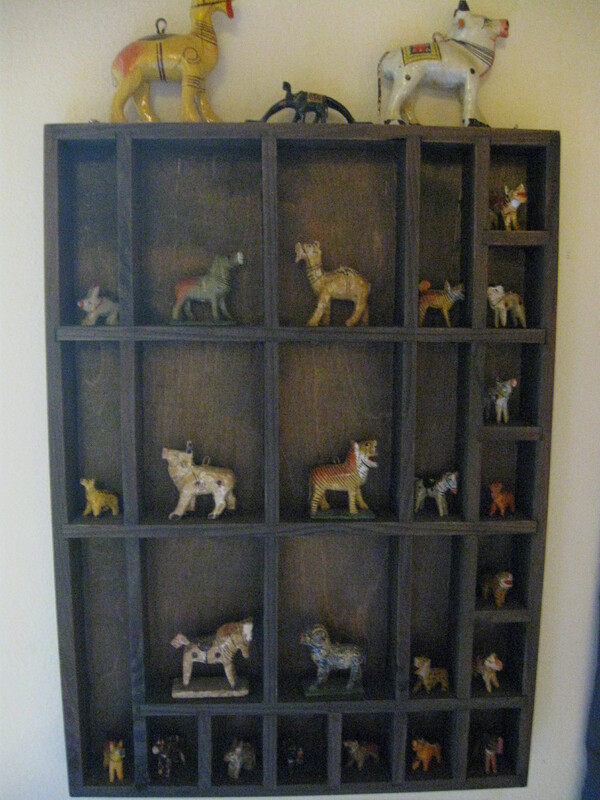 They’re little papier mache animals, and they are indeed from India. I just love them; and I try to buy them whenever I find them. However, prices will vary wildly, depending upon who is selling them. The smallest ones are often used in making beautiful necklaces; I’ve bought whole necklaces for a couple of dollars. I take the animals off of the necklaces and display them as you see here. But, I’ve also seen the animals priced at a dollar each. The larger ones go for several dollars each. These are vintage, probably made in the 60’s or 70’s. They have some wear on them due to their age, which I happen to like a lot. The larger ones can be hung, so I put them on my multi-cultural Christmas tree every December. This intricate, lovely embroidery was made specially for me by my young co-worker who moved to Seattle from Ukraine. Lyuba gifted it to me in 1996. I’ll never part with it. It has an honored place on my wall. If you come across items like this, please appreciate them for all the hours that go into their creation. This is truly a museum-quality piece. Lyuba also played Ukrainian folk instruments. It’s great when children are taught about their culture, whatever that may be. 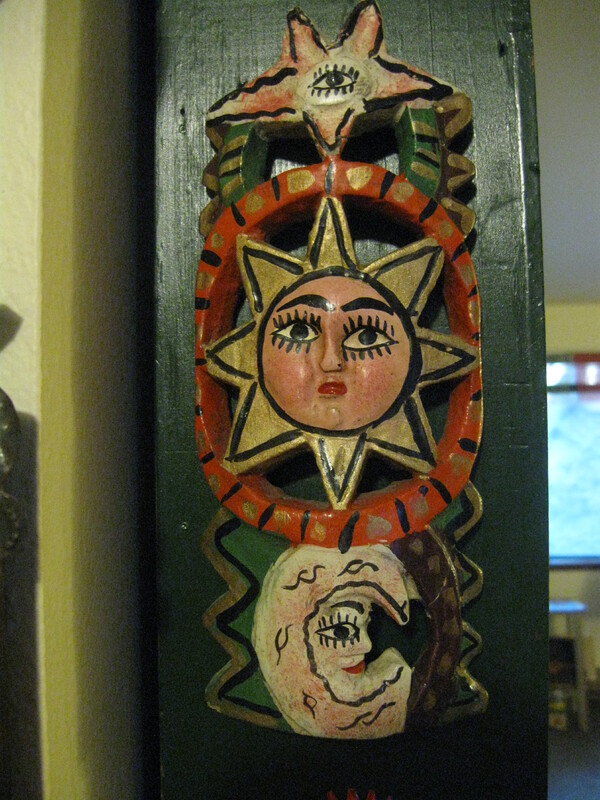 Here’s a beautiful example of North American folk art carving. This “Old Man Winter” piece is signed “LN”; it’s dated “1971”. 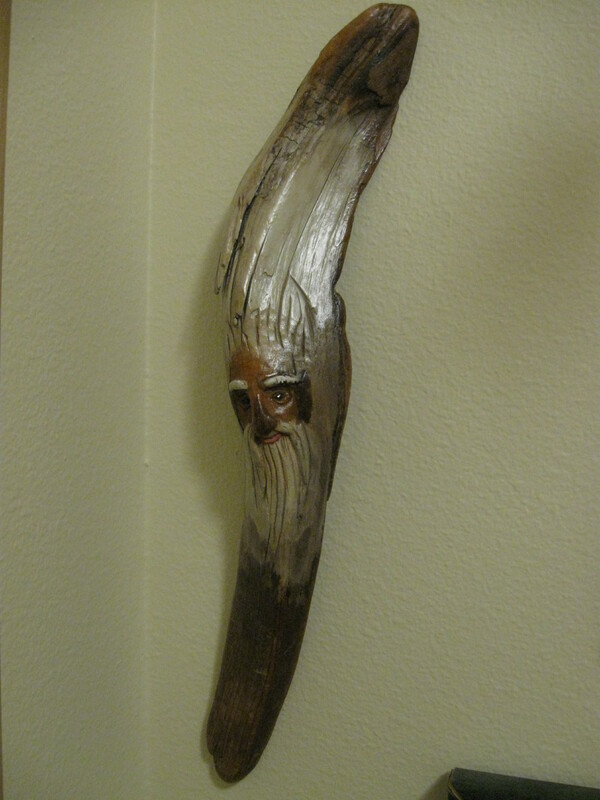 I have another, similar carving which is a little newer. You can see it in the very top photo, up above. That one is signed “Lee”. 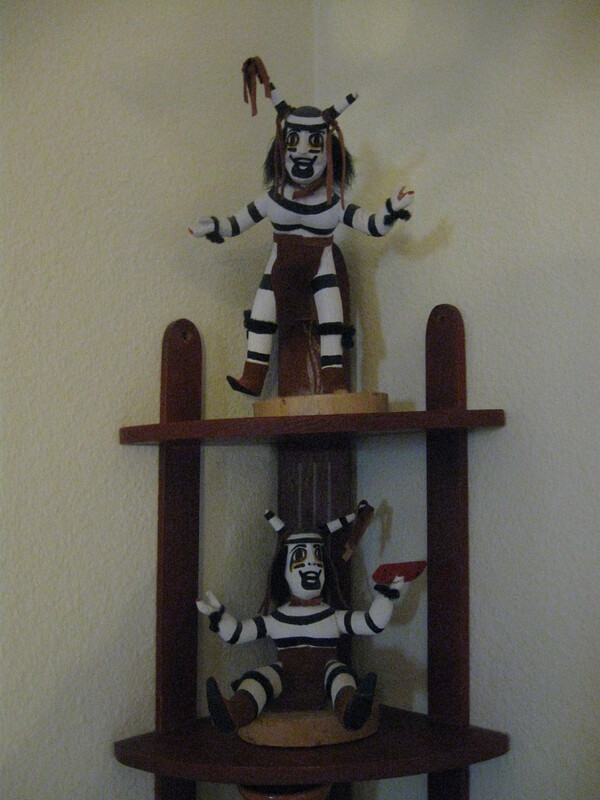 I bought them together; I’m sure the same carver created them both. Beware, because you can wind up with a fake made of resin. This is a popular motif, I’ve seen quite a few fakes. Nothing replaces hand-carved. Now, just to inspire you to make your own art, I’m showing a couple of pieces that I made. First, I found this little cedar wood item which was originally made to hang on the front door of an abode. It held a message pad, and it had a pencil attached to it. I repainted it inside and out, and added a “protective hand” symbol which I found at a flea market. 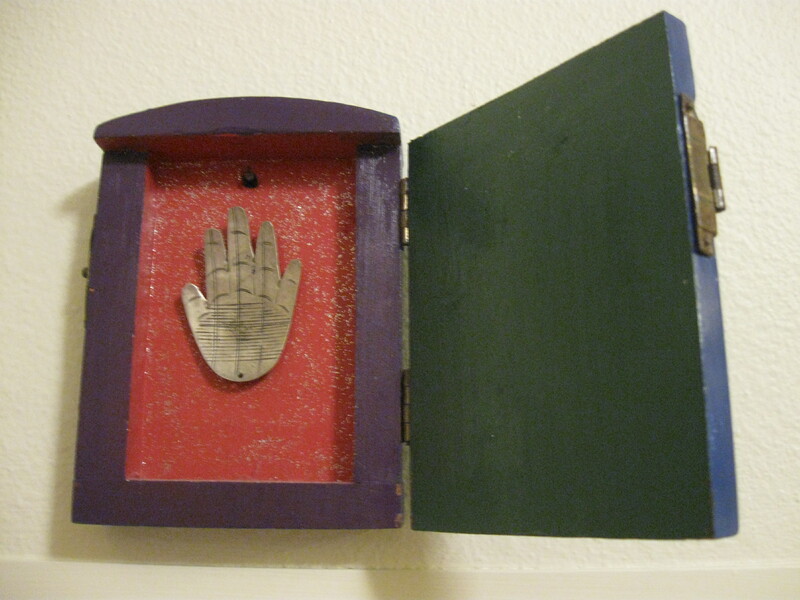 The protective hand is seen in many of the world’s cultures. Here is the same item with its door partially closed. 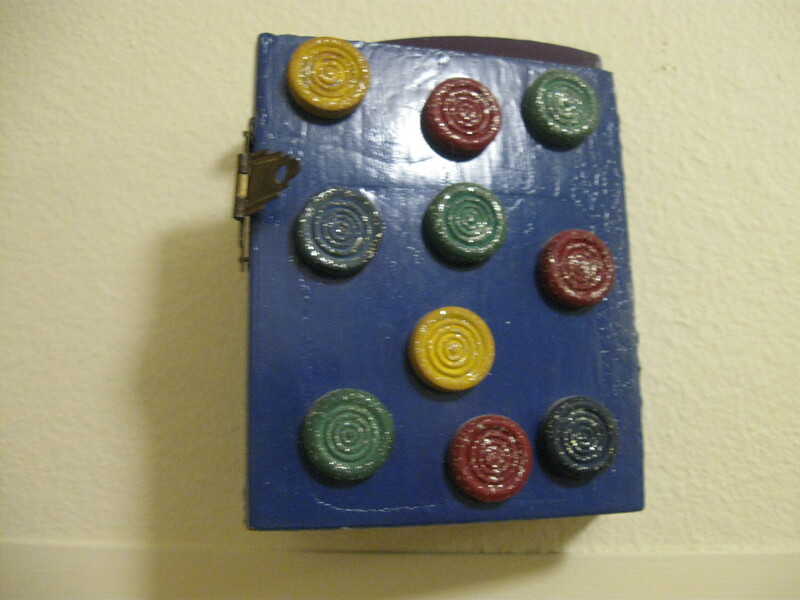 I used markers, which I painted, from a 1930’s Parcheesi game for decoration. The game was incomplete, so I didn’t hesitate to take items from it to use in this “found art” piece. 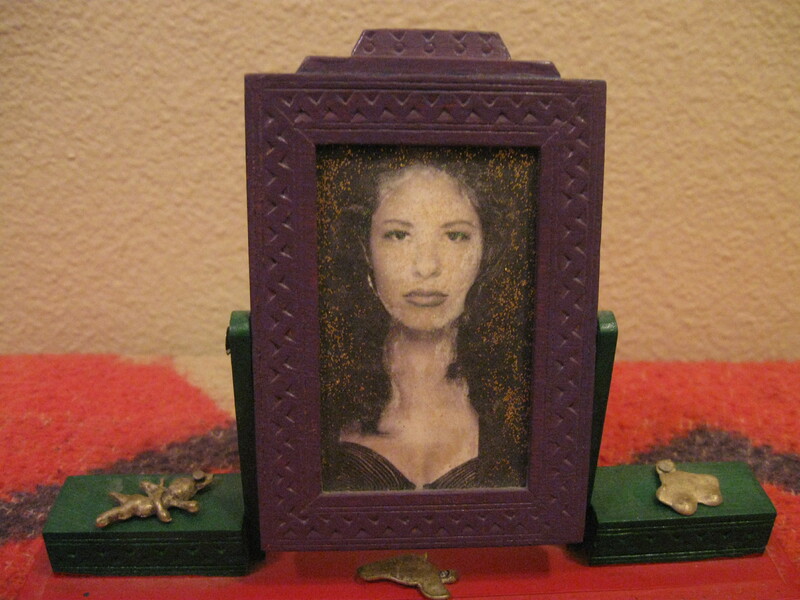 I made this shrine to the legendary Texas Tejano singer, Selena Quintanilla-Perez, whose life was brutally taken by her former fan club president, in 1995. Although she was so beloved by the Hispanic community, I, like many others, never really heard her music until after she was taken from us. Constructing these kind of shrines dedicated to folks who have passed away is a Mexican tradition, and I would say, a tradition of just about all cultures. I gave the black and white photograph a vintage look, and I attached little Mexican milagros (miracles) to the base of the frame. I actually used a sandalwood frame from India, which I cut-down to size and painted with good old Crayola paints, in 2002. In folk art, you use what you have! — I made this to pay respect to Selena, because I don’t think she received the recognition and/or respect she deserved, during her lifetime, and after her death. Here is a stack of some of my collecting books, nestled in a piece of 1930’s furniture. I haven’t looked at them since I moved in here three years ago, because I dare not disturb my cable box! It’s very touchy about — being touched. I’m fortunate to have additional books. I keep the ones I really want to look at closer at hand. 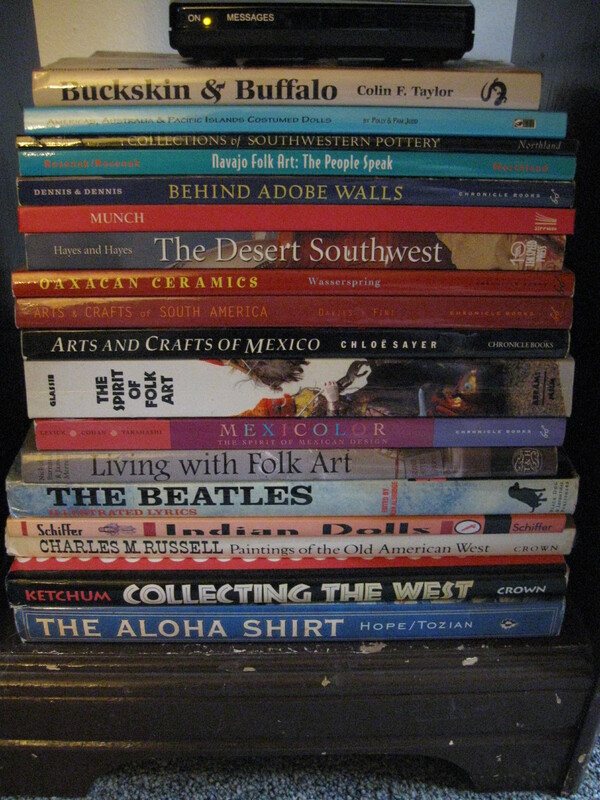 But in the past, I learned a great deal about collecting my kind of art by reading these books. And yes! There is a Beatles book here, which doesn’t belong. But hey, how OCD do I have to be? 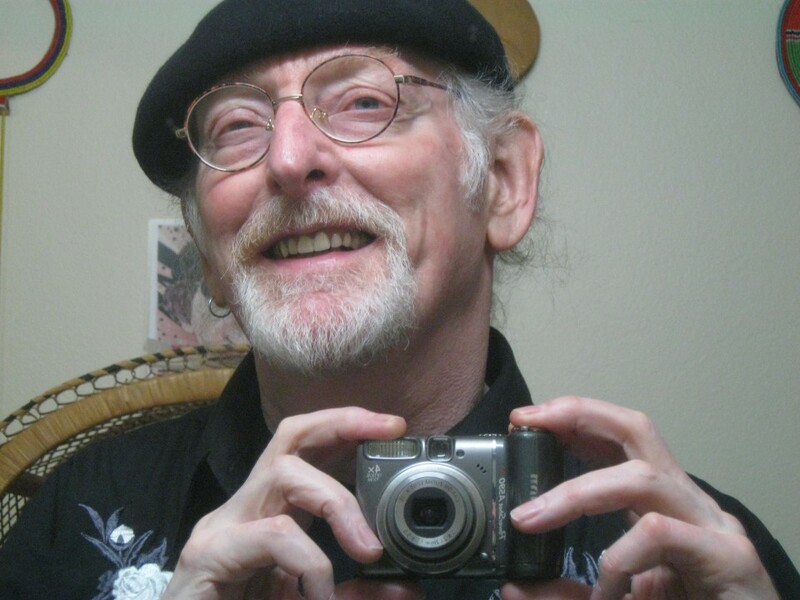 Please look in my archives for other stories about my various collections of art made by the human hand. And go for it: decorate with folk art! You may have noticed a theme running through my story: assigning a precise date to a piece of folk art is not easy. Items can be made to look old. And as mentioned above, the term “vintage” may be included in an item’s description on the internet, without any kind of proof offered to back-up the claim. — Basically, a truly older piece will have some wear; it will probably be more detailed. It will appear as if sufficient time and care was taken in its creation. It wasn’t just quickly put together, for bulk sale. Bonus photo: How to disguise an ugly kitchen: cover it up with folk art!